Denver, CO — Thursday June 20 through Saturday June 22, the nonprofit group Architects & Engineers for 9/11 Truth (AE911Truth), will host the new evidence at an exhibitor’s booth at the 2013 annual convention of the American Institute of Architects. 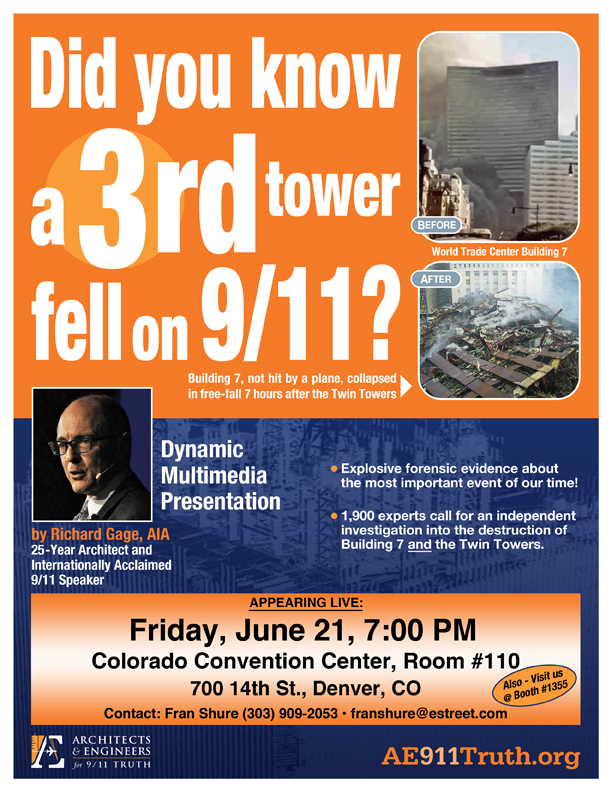 AE911Truth founder and CEO Richard Gage, AIA, Architect will be presenting the new evidence in a controversial multimedia presentation with Q&A on Friday night June 21 at 7pm in Room #110 also at the Colorado Convention Center in Denver. Gage represents more than 1,900 licensed and/or degreed architects and engineers who have signed a petition calling for a new, independent investigation into the 9/11 attacks. These building professionals are joined by more than 17,000 other supporters, including a broad professional cross-section of American society, including chemists, physicists, current and former service members, and others. Video loops and free literature will be on hand to help booth visitors understand the group’s evidence and concerns. Their milestone DVD 9/11: Explosive Evidence – Experts Speak Out, which was aired/pledged locally at PBS affiliate Colorado Public TV, will be provided to the 14,000 architects in attendance. The documentary, which features 43 technical and building experts including high-rise architects, structural and fire protection engineers, etc., had become the most watched & shared video on the national PBS.org website. Volunteers will be presenting scientific evidence that the group says contradicts the official explanation of what brought down the World Trade Center twin towers and little-known Building 7. The group’s website cites evidence for explosive demolition as the cause of the destruction of the three World Trade Center towers on 9/11. AE911Truth points in particular to the destruction of a third skyscraper, 47-story World Trade Center 7. This building was not hit by an aircraft, yet collapsed straight down in less than seven seconds for more than 100 feet of free-fall – showing no resistance at all. Experts note that this undisputed fact alone rules out the official collapse explanation, which is based only on fire. Free-fall means that virtually all of the supporting heavy steel structure was shattered and moved out of the way by something other than the weight of the upper section. If the upper section had been crushing weakened, overloaded steel, the collapse would necessarily have proceeded at a slower pace than free-fall. According to the group, this follows from simple high school physics. NIST, the federal agency last assigned to investigate the destruction, admitted both of the key facts above, after being confronted by physics instructor David Chandler at a technical briefing. Yet the agency left unchanged its conclusion that fire alone brought down these steel-framed skyscrapers, for the first time in history, evenly, rapidly, and exactly in the manner of a classic controlled demolition. Both the 9/11 Commission Report and the leader of the NIST study admitted that the twin towers also came down “essentially in free fall.” Yet the vast majority of the NIST report on the twin towers admittedly analyzed only the conditions that brought the buildings to the point where they were poised for collapse, without analyzing the details of the collapses themselves. The report’s authors complained of inadequate computer power to conduct a simulation of the actual collapses. Yet several simple computer simulations written by independent researchers, notably those by Jim Hoffman (http://911research.wtc7.net/wtc/models/) and Stephen Keeling (http://math.uni-graz.at/keeling/wtc/wtc.html) have been available online for many years now. They show that on very conservative assumptions, the destruction of each tower should have taken much longer or should have come to a halt long before reaching the ground. AE911Truth bases its conclusions solely on forensic evidence and does not engage in conspiracy theories or in assigning blame for the destruction. The group’s conclusions are shared by hundreds of scientists, senior-level military, intelligence and government officials; pilots and aviation professionals; scholars and university professors; 9/11 survivors and family members; and media professionals around the world. The 9/11 Truth movement, which Time magazine called “a mainstream political reality,” is gaining rapid momentum. Gage has presented more than 300 times at events covering 82 U.S. Cities and 27 foreign countries. Fox TV’s KMPH (Fresno) interview of Gage attained over 200,000 YouTube views in two weeks. A Danish chemist, AE911Truth petition signer Dr. Niels Harrit, was interviewed by Danish network television on April 6, 2012. The interview, now viewed nearly 250,000 times, discusses the advanced nano-engineered residues found in the World Trade Center dust by an international team. These residues point to the use of nanothermite in the Towers’ destruction. Nanothermite was developed in the 1990s by US national laboratories and defense contractors, and takes advantage of the highly exothermic thermite reaction plus small particle size to increase the power of explosives and rocket fuels. These troubling new findings are shown in Gage’s presentation. The convention takes place at the Colorado Convention Center, 700 14th Street, Denver June 21-22. The group is expected to be one of the only nonprofit organizations attending the convention. San Francisco Bay Area architect Richard Gage, AIA, will present in Denver Friday, June 21, 2013, 7:00 PM, at the Colorado Convention Center, 700 14th Street, Denver, Colorado, room 110. Please come and bring a skeptical or uninformed friend–especially an architect, engineer, or scientist if you know such a person. We invite you to forward this announcement to all your contacts–in this way we all become the press. This presentation by Mr. Gage will dovetail with the prestigious American Institute of Architects National Convention, which meets June 20 – 22 at the Colorado Convention Center. There will be an opportunity for questions after the presentation–the toughest questions are welcomed! For more information see Architects and Engineers for 9/11 Truth. See location map of the Colorado Convention Center and parking directions. There are many ways to arrive at the Colorado Convention Center, including the RTD Light Rail, which has a stop next to the Center. Please come early to park and locate room #110. Attention: Our monthly meeting is canceled this month since the date conflicts with this presentation by Richard Gage, AIA. But, mark your calendars! Colorado 9/11 Visibility Video and Action Meetings are otherwise held the 3rd Friday of each month in Denver. Please observe the parking signs: Steele St., 16th Ave., and Colfax Ave. usually have available parking spaces. Mark your calendars! Boulder 9/11 Visibility Video and Action Meetings are held the 4th Wednesday of each month. What: Boulder 9/11 Visibility will show the classic film 9/11 Mysteries. For a description of this film, see http://colorado911visibility.org/. Parking: Free parking is available after 5:00 PM on Colorado Avenue or in CU Lot 359 due west of the Math Building (but very competitive when school is in session). Paid parking ($3 flat fee) is available in Lot 360 directly across the street from Folsom Field Stadium. Attention: Grand Junction will cancel its monthly meeting this month. Documentaries are not the only medium through which people have their worldviews successfully challenged. Some of us are more affected by storytelling. Good fiction, music and lyrics, poetry, and fairy tales can often pierce the depths of the psyche where facts and rational analysis fail. 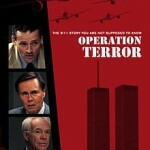 For this reason, this month we are pleased to air the docudrama Operation Terror, written and produced by filmmaker Art Olivier, a former mayor of Bellflower, CA. This film tells a story, and does it well considering its low budget and that it was written and produced by a first-time filmmaker.